Luton Town and 2020 Developments have written to Luton Borough Council to request a short deferral of the committee date for their Newlands Park planning application. Following the successful outcome to the club's Power Court planning application on Wednesday evening, which saw the Hatters granted permission for a new 17,500 stadium, the council were due to meet on Wednesday, January 30, to consider the mixed use scheme at Newlands Park. 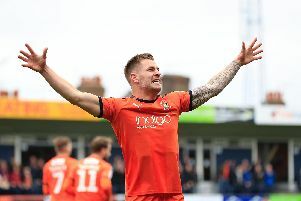 However, with Luton still searching for a new manager, plus the transfer window remaining open until the final day of the month, Town have requested further time, as a statement on the club's website said: "We have taken the decision, after due consideration of our available resource in regards executive time and involvement of board members that our interests, both on and off the pitch, are best served by delaying the Newlands committee date in the short term. "We look to receive confirmation of a new date imminently from the council once available diaries and resources at the Town Hall have been considered. "We also wish once again to place on record our appreciation for all the time and effort employed by everyone in Luton in dealing with our two applications thus far. "Wednesday was a momentous day in the history of both our club and the whole town. "The unanimous support given by members of the planning committee for our plans confirms our longstanding belief that our vision for Power Court represents a once in a generation opportunity for the entire community to move forward. "We have also been very clear on the importance of Newlands Park and its own integral role within our plans, and we look forward to making this case to council members in the very near future." A statement on the Luton Borough Council Twitter account said: "Following a request from the applicant and further representations, the date of the meeting to determine 2020 Developments’ planning application for Newlands Park will be deferred. "We're looking for a suitable alternative date and will let you know as soon as this is confirmed."